With Japanese women carrying the longest life spans of any one country in the world and with Japan being home to 50,000 centenarians (Yeahuh) there’s no doubt that the country is amongst the healthiest in the world. Japanese women today are admired for their petite, slim figures and flawless, ageless skin. This, along with their ultra long life spans is a good enough excuse to find out just how the Japanese pull it off. So to help us understand more we got chatting to author of Japanese Women Don’t Get Old Or Fat, Naomi Moriyama who revealed to us ALL the little-known secrets of the Japanese diet. “The Japanese way of being healthy is not about short cuts, miracle oils or magic pills. It is a series of basic, easy-to-remember habits that can all combine to help fight disease, protect your body and prolong your life," says Naomi. While the UK and US munch down on slabs of red meat, the Japanese are eating tons of fish to stay lean and healthy. A jaw-dropping figure nonetheless! 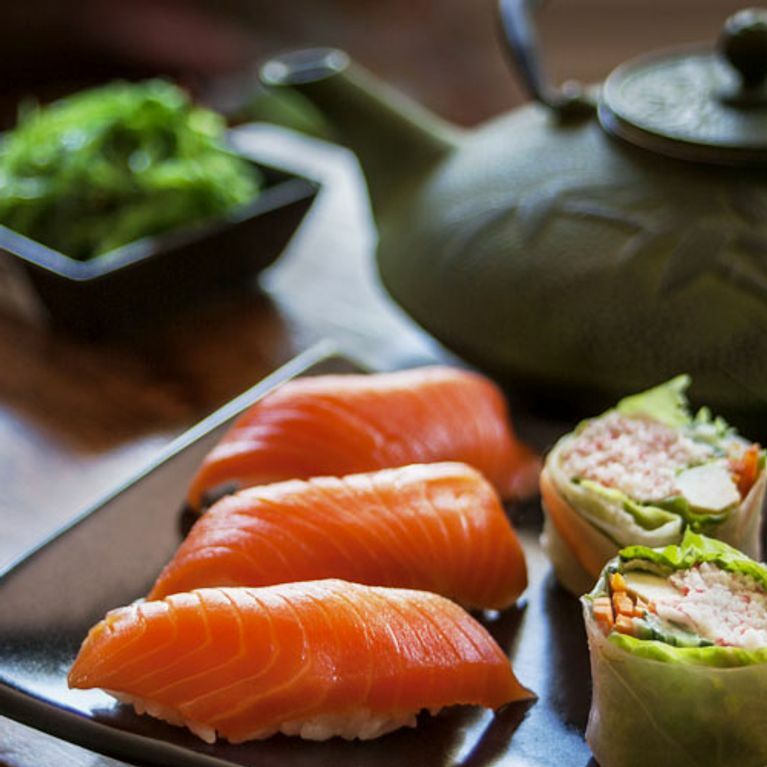 It's no wonder they have such great skin and hair - the Japanese are swimming in heart healthy Omega-3 fatty acids, which are plentiful in oily fish, particularly salmon. Omega-3s help protect you from heart disease, cancer, arthritis and other ailments too so make sure your getting your fair dose! Naomi’s Tokyo Kitchen Tip: Eat more fish. If you're not a fish person, invest in a good quality fish oil supplement. Simples. Brown rice, Japan’s "original ancient power food" is a super healthy whole-grain, rich with fibre and high in anti-oxidants. It also helps stabilise your blood sugar levels helping you feel satisfied for longer (without the hankering cravings). Naomi says, “Rice is the bedrock foundation of Asian diets, and in Japan it is served in its own little bowl with almost every meal. Rice is a low-fat, complex carbohydrate that fills you up, gives you energy and leaves less room for unhealthy foods like packaged cookies and pastries, which can contain heart-unhealthy trans-fats.” So no more of that biscuit scrounging! ​Naomi’s Tokyo Kitchen Tip: Do it like the Japanese! Try to incorporate a small bowl of short or medium grain rice with every meal and the rest will be history. From tofu to edamame to miso soup, the Japanese LOVE legumes. In fact, you will hardly ever come across a dish that doesn't include them. And rightly so. Legumes are rich in potassium, folate, magnesium, iron AND low in fat which makes them a great contender as a healthy main. They're highly nutritious and extremely versatile to cook with so there's no excuse not to try! Think soup, curries, salad, dips and even chilli. You can also get your greens from something as simple as miso! Founder of Miso Tasty, Bonnie Chung says, "In a study involving over 20,000 Japanese women, it highlighted that those who consumed miso regularly had a 40% reduced risk of developing breast cancer. Miso is also known to reduce the risk of lung, stomach and colon cancers because of the high levels of antioxidants that protect against free radicals." Naomi’s Tokyo Kitchen Tip: "You don’t have to stop eating red meat, just enjoy it less often," says Naomi. Instead enjoy natural forms of soy and cut small chunks of plain tofu into your meals as a substitute for red meat or cheese. Embrace legumes! According to the Harvard School of Public Health a diet rich in fresh fruit and vegetables can lower blood pressure, fight cancer, reduce your risk of stroke and heart attack, protect your eyes, improve your memory and help manage your weight. But despite the advantages, Britons still aren't getting enough. Eating fruit and veg is a pleasure not a chore. So what's stopping you? "Nutritionists beg us to 'eat more fruit and vegetables'. But many people don’t. That’s because you may not realise how sinfully scrumptious vegetables can be," says Naomi. The secret? Prepare them Japanese-style. "Buy a variety of different fresh vegetables, chop and stir-fry them in a modest amount of rapeseed oil in a pan or wok at medium-high heat. The taste is delightfully decadent." Naomi’s Tokyo Kitchen Tip: Open your mind to fruit and vegetables and be explorative. There are tons of different ways to incorporate them into your meals (and NOT just as a side dish). In Japanese food, seaweed is an integral part of the diet, as Naomi says, they are almost 'ubiquitous'. You can find it as a garnish, condiment, stock or even as a key ingredient in any Japanese meal. Basically, in everything. But most Westerners are hesitant when it comes to this kind of sea vegetable. It's not particularly common in our diets... but fear not, you probably already like it and don't even know it. "If you love sushi, then, you already love nori seaweed - the flavourful seaweed that it’s wrapped in. There are also nutritional benefits to consider when incorporating moderate amounts of seaweed into your diet. Seaweed, particularly brown seaweed such as wakame and kombu, ‘may be one of the major cancer-protecting components of the Japanese diet’, said one research toxicologist. ​"Besides being high in fibre, B vitamins and the minerals magnesium, calcium and iodine, the scientist claimed that seaweed contains high levels of bioactive compounds ‘that have been associated with antioxidant, anti-inflammatory and antiviral activity’." Which sounds like just the type of powerhouse food we need in our diets. Naomi’s Tokyo Kitchen Tip: Start slowly incorporating seaweed into your diet by whipping up an easy nori salad or stir fry. Naomi also recommends "getting a container of shredded nori sea vegetables at a Japanese grocery store and using it in place of the saltshaker on your dining table. Sprinkle a few shreds over rice, or put some into your miso soup or stir-fry." You never know until you try! "​Japanese-style home cooking is light and brings out the natural beauty, flavour and healthfulness of ingredients. Instead of cooking with butter or beef fat, which contain high percentages of heart-unhealthy saturated fats, Japanese women cook fish, meat, soya and vegetables either in canola, rapeseed oil, rice bran oil, fish stock, or combination of two." Which is not a bad choice compared to our more favourable vegetable oil and olive oil! Rapeseed is high in antioxidants and amongst the LOWEST in saturated fats compared to any other oil. It's also rich in omega 3, 6 and 9 and vitamin E making it a super healthy option for any home cooked meal. ​Naomi’s Tokyo Kitchen Tip: Cook with canola, rapeseed or rice bran oil and instead of salt or heavy sauces flavour food with herbs and citrus juices for taste. Now that's how you achieve true deliciousness without the sugar and fat. Japanese people love to drink green or herbal teas and prefer low-fat milk instead of fizzy, guzzling beverages. Things like matcha green tea are big business in Japan and loved by everyone. You'll find it in almost any food there. From drinks to desserts to breads - they've got it. And if you're wondering what they have for dessert don't count on a slice of cake. Naomi says, "A typical Japanese dessert is an assortment of seasonal fruits, peeled, sliced and arranged on a pretty plate. Western desserts like ice cream and cakes are enjoyed too but offered in smaller portions and subtler flavours compared to the West. A cup of Japanese green tea, without cream or sugar, at the end of the meal is the perfect finish." ​Naomi’s Tokyo Kitchen Tip: Drink more herbal tea! If you're not much of a tea drinker try setting a realistic goal and drink three teas throughout your day. In time, you can work yourself up. Finally (and a very important finally) make sure that when you're eating you eat SLOWLY and MINDFULLY. Savour the flavours and enjoy each bite - your food isn't going to make a run for it. We pinky promise! If you're interested in learning more about just how Japanese women stay so slim pick up Naomi's book, The Japan Diet: The secret to effective and lasting weight loss. You won't be sorry! Keen to adopt the Japanese way of eating? Tweet us and share your experience @sofeminineUK!